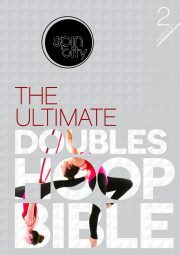 The 2018 5th Edition Spin City Hoop Bible is a great reference book for aerial hoop enthusiasts worldwide. With over 380 pages and 1500 photographs of aerial hoop moves! The 2018 5th Edition Spin City Hoop Bible is a great reference book for aerial hoop enthusiasts worldwide. With over 380 pages and 1500 photographs of aerial hoop moves, useful hints and tips, strength and conditioning exercises and combinations from a beginner to advanced level, this is the perfect companion to your hoop training.